-Age of armour has both stand alone free scenes and free addons for his products in the daz store. -The SDK is available in the CarraraCafe downloads. I have some various freebies at ShareCG. Nothing to special. Just some stuff I had made for myself or experiments that I thought might be useful to others. I also have a fix for the smoke particle emitter that seems to give people so much trouble. The newest thing I just got around to uploading today. 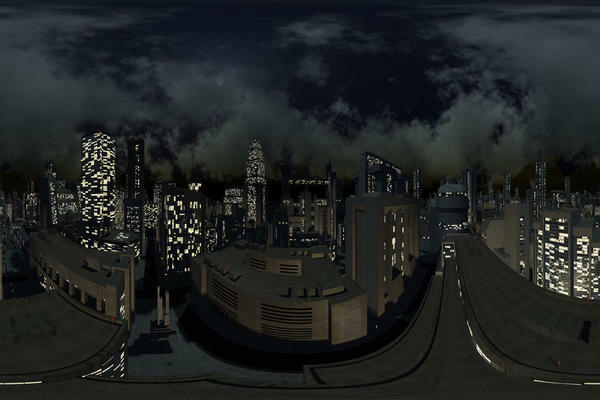 It's an improved night-time spherical render of Dystopia City blocks. Useful in the scene's background, or mapped to a large sphere. The full size version is something around 10,000 x 6,000 pixels. Thanks for the updates evilproducer. Age of armour has both stand alone free scenes and free addons for his products in the daz store. Complete scenes, lights, shaders and of course the magazine. Added some shaders links from the old forum and Carrara trial links, check the first post. Added a link to Mark Bremmers site and direct links to his freebies, a shader and a scene. Hope to get the thread as a sticky here as well. Anyone know of what might have happened with Yet Another ToonShader? I get 404 errors when I try to access the page. EDIT, Cannot find the C8 versions, anyone got them? PM me please for posting at CarraraCafe. I have two items uploaded to sharecg. The first is a set of polyhedral dice -- there are others but these are as free as you can be and not be in public domain. I also like to think they have good UV mapping and if for some reason you have PageStream there's a template to ease creation of arbitrary font/numbering. The dice are not what I fully intend (only the d6 has morphs) and I've learned enough more about modeling to perhaps get the desired morphs in (oddments like corner clipping on the d4, d8 and d10). The second item is dynamic hair for Ursus Arctos and so is of more limited use. Your links take me to the upload screen. Try viewing your gallery and navigating to the product's page. On the right, there's a box with the link you can copy. Since there seem to be many new users trying Carrara with the release of C8.5, I thought it would be good to resurrect this thread. Just so it's not a zombie thread, I thought I would repost links to some of my previous freebies. Just wanted to say I'm humbled by the Carrara community, especially guys like you Evil, who go above and beyond and not only give tips and advise and feedback in the forums, but actually go to trouble of creating free stuff for others to use and learn from (just checked out your link and the fantasy village terrain really looks good). Fancy a free comfortable chair to place your bottom on? 15 morphs (try blending morphs together to get a unique style). Basic wood and fabric textures. get your copy and have some fun ! Thank you Jon and Kakman! Thank you Gareth for making the chairs available! I will have to DL them! Thanks for posting that 3doutlaw! No problem, unfortunately, it immediately fails with Genesis. :( Ticket submitted, and I don't think zgock has v85, so likely won't anytime soon. None of that data is included within the clip. I also excluded the hands from the NLA clip so that they could be posed independently. Hint: you can also layer NLA clips! If anyone has suggestions for more freebies, please post in the forum.